Something that has been completely unannounced is the drawing of the 4th round of the Swedish Cup. MAIF will play (again) away but this time against IFK Norrköping. Game is to take place the 6th of july. After the Bromma kids, which we won in the cup, again an opponent from SuperEttan. We played them away already in the championship, a game that finished 1-1. Let's hope we win this time, so we can get some of the games at home, and draw some benefits from these Cup games, and not only expenses. 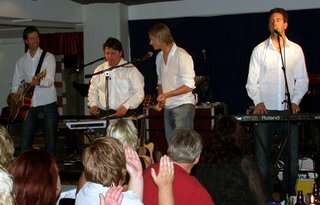 Simon Sjöfors was one of the players representing the team during wednesday evenings´ yearly sponsor and memberships´ party of MAIF. 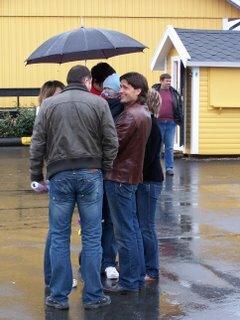 Simon was challenged by Nöjeskompaniet to take part of the show, to the spectators great satisfaction. First win of the 2006 season for MAIF, away against Jönköping Södra. 0-2, goal from Lindberg on a corner from Danne at the 54th, then goal from Eken served by Johan at the 72nd. So now we've got 6 points and are 12th of the league, i.e. just above the mark for teams going down. Now I hope we've kissed that evil line good-bye for good. 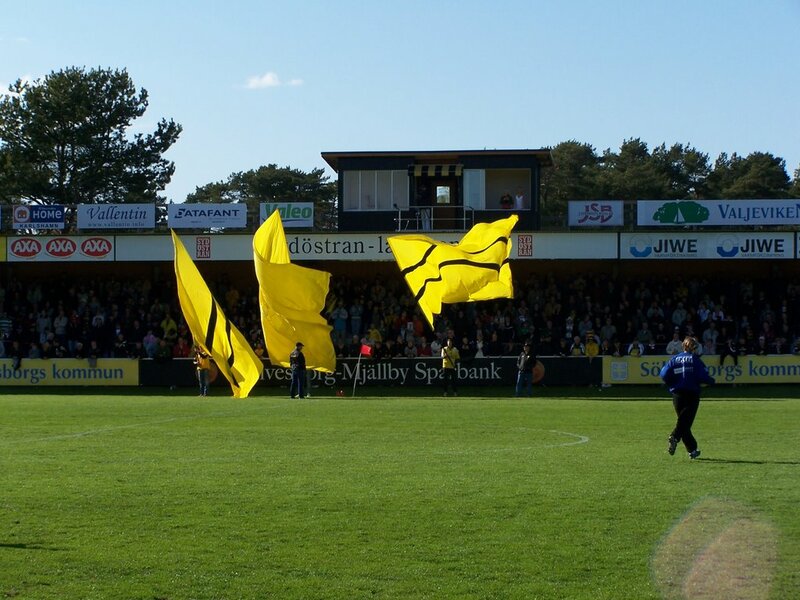 Although next week's game is away again to Trelleborg, 2nd of the SuperEttan and no lost games yet. Time for a first for them too? We'll see. 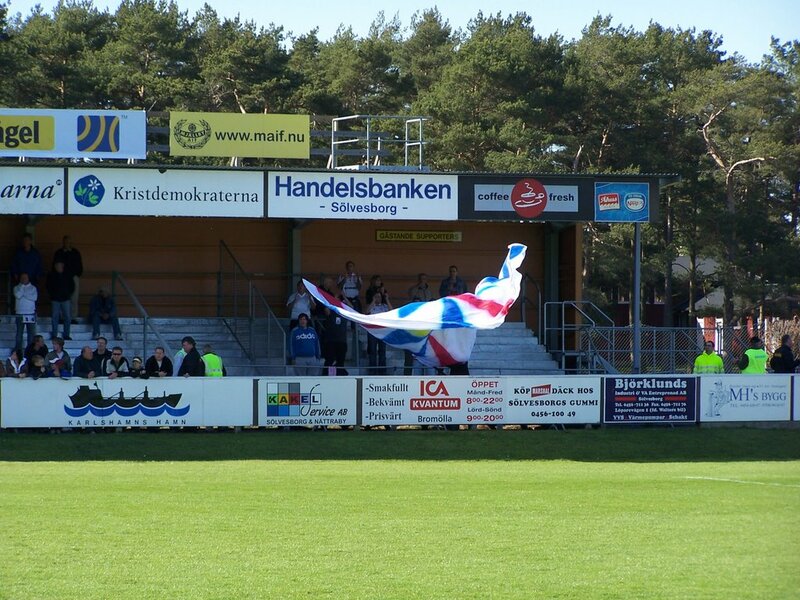 10, 15 supporters d´Assyriska. A lot of noise. Impressive. 1 898 spectators in total inclunding ÅhusMink, first visit in Strandvallen ! The game today lasted around 3 minutes. The last 3 minutes, from minute 90 to minute 93. Before that it was a lot of balls to the left, to the right, bla bla bla, a screw-up in central defense 0-1, some more balls to the left, and to the right, bla bla bla, another screw-up in central defense 0-2, and then somehow the team woke up at the 90th minute, and scored 2 goals during stop time. First Johan Svensson transperced the defense and shot a cross unreachable to the Assyriska keeper, and then at 92:30 Olsson sent in another ball in the net. If they didn't know, Assyriska should have learned a lesson today: the best defense is attack, they were pulling back too much at the end. Why was it so? Well, around the 80th minute, it was quite obvious from my place actually: we had 4-5 players in defense, 4-5 players in offense and 10 minus 5 minus 5 = zero players in the middle. Nobody. So defense sends long ball up in the air, Mother Nature who was quite a bit blowy today puts a grain of salt or two in the equation, and the ball has to be somehow be taken down and sent further. But while the ball is up there flying, Assyriska had all the time to place themselves right, and since our forwards were not even always trying to get it, we lost 80% of these long balls, and made little of the remaining 20%. to the referee, who was very much a pajas at times. He owes us 2 penalties: in the 1st half a hand by some Assyriska player in his own zone, and near the end the attack of the keeper on Johan Svensson was crystal clear, but Mr Hyvärinen was looking... elsewhere, and his line-man too apparently, despite being merely 10 meters away. Hiir-Sa, Persson and Olsson were not very inspired today. Good game by Danne, Eken (although the first goal starts from his mistake). As usual. Fegler did what he could, the 2 goals being more or less 1-to-1 situations, even the best ones don't stop them all. The replacers today Cederberg, Tobbe and Jonas did good. Good animation of the midfield and vision of the game by Jonas. Best player on the pitch today was Johan Svensson, always agressive. A deserved . to Sjöfors. Always slow, rarely turned in the right direction, waiting for the ball to came to him, i.e. the Assyriska player easily stole it from him. Unable to get rid of his defender to be in good position for the headers, and don't say it's impossible, just ask Tobbe how he does. Got a deserved yellow for an unsucessful Maradona. In the second half he did so little he was not even making fouls anymore. Oh and by the way, to the trainer duo for leaving him there. To think that it takes 2 brains to not make this decision is beyond me. The final layout with Tobbe on the right and Eken in the front together with Olsson is working so well I don't know why it's only used the last 30 minutes of every other game or so. Final goes to the Strubbarna. They have been absent so far this year. The 10 Assyriska supporters were standing for all the animation, singing and cheering all along. To which the Strubbarna responded with ... a deafening silence. If the supporters are not even supporting at home, why are they even showing up? You're the 12th player, remember? Obviously I forgot to post anything following yesterday's match which ended up in a draw 1-1 in Norrköping. Full match review is available (as usual) in swedish on SF. The short version: we played the first half quite like against the Bromma kids, lot of pressure, Eken put in the first goal at the 26th minute. 0-1 at the half time. After the break, the Norrköping have had their butts kicked and make some changes (2 players changed), which change the deal, and Norrköping comes back to 1-1 at the 57th minute, scorer not unexpectedly Santos. The last 20 minutes are more equal again between the 2 teams, but the score remains final. Fegler has apparently been pretty busy in the 2nd half keeping the score to 1 down, while further up Persson, Johan Svensson, Hiir-Sa were making the game. When will the first 2006 victory come? Just a short post to mention that our 2 local players and ex-MAIF players Tobias Linderoth and Christian "Chippen" Wilhelmsson have made it in to the swedish selection for this year's World Cup. Congratulations to both players, and looking forward to see good MAIF action on the green fields von Deutschland. For those of you who receive it, our very own Danne is in picture in the latest newsletter from SvenskaFans, in a header duel against an unidentified Ljunskile player. Pavel Zavadil and his family saw the game together with Dusan and his girlfriend Nicola. Before the game I was pessimistic on the chance of Maif to do something against the team who just won 5-2 against Landskrona. Last year we lost both games and the one at home was the only one we lost in the autumn with Thomas. But I have seen a very good game from MAIF this afternoon despite the draw. Terrible weather, rain and cold but no wind. 1500 spectators unfortunatelly. Less than 10 supporters from Bromma. 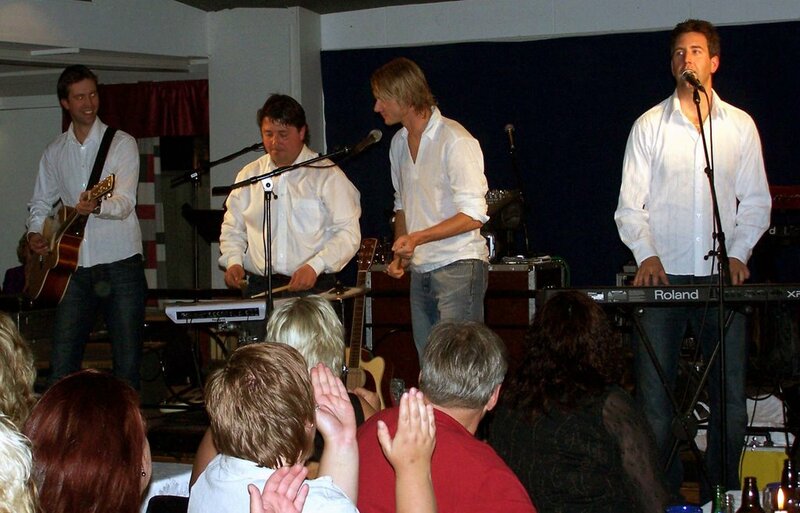 Mjallby played in 4 –4-2 transformed in 4-2-4. Jonas Andersson injured and Dusan red card last game were not in the troup. First game for Christian Fegler with Maif. Mjällby is lucky this year to have two good goalkeepers. He didn´t get so much to do but he did it well. He stopped the ball on the goal but it went back on the Brommapojkana player. Very good the first 25 minutes. Big mistake at the 25th minute. He lost a duel against his forward which gives the goal. He did well after. Difficult moment for Johan at this time. Very present with his head but he is involved on the goal like Lindberg. He did a second big mistake in second half. Both depending on the slippery grass. We should expect more for a player coming from Malmö FF. Good activity. No mistake. D. Nilsson takes all the corner and free kicks. In progress. No mistake, good game. Injured at the end and put out only at the 69th minute. Maybe too late. Enormous game from Johan Persson. He is like Hiirsa but younger and more technical. He took an incredible number of balls with his head, went until the end against all the balls. He will become the favourite of Strandvallen! He seems happy to play near J. Persson. Good game. A enormous shot on the goal – "the ball was flotting in the air". He is much more in form then last year. A locomotive this Eken! He passed four players on 45 meters ! He gave a "Caviar" (french expression for a un-missable assist) to Simon. He was there at the good moment to put the ball in the goal. He got a goal refused. He had two guys on his shoulders on every corner. He is the number 9 and he should have not missed the one to one against the goal. Ok, the conditions were difficult and the ground very heavy but if he wants to play in Allsvenskan, he should not missed this kind of action. A goal refused – maybe justified. The trainer of Brommapojkana a little nervous, put back in place. 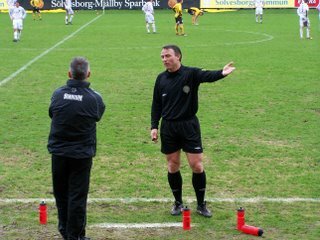 A good communication with the line referee several times. Yellow cards given at the right moment. Monsieur Kovacs has been good. Not so much activity because everybody was frozen. Good grilling. Thank you Niklas. Hammerfall – the curling song. I propose"Jump" next time for ValjeMinken. Monsieur Kovacs has been good. For my first game of the season, I was quite pleased with what I saw, unlike what i previously feared. Mjällby completely dominated the Bromma kids in this game. I saw a very good collective game, good passing game although a little simplistic at times. Most important I saw all people building the game. Also it seems that mostly everybody was paying attention as to where the ball was going after they received it, not just jumping to say "Hey, I was first on the ball, look how high I jump!" (it did feel so some times last year). Olsson was very altruist, requesting a lot of support from his midfielders so he could place himself better. He was also fighting for all 90 minutes, not waiting for others to serve him a goal but really actively participating in building the actions. Eken was remarkable, his assist on the goal is textbook-perfect. He was under-used though. Simon deserves his goal, he's been dangerons many times, even though the Bromma defense did not leave him much room (literally speaking). Hiir-Sa I'm not sure, he's so like Persson (same size, same hair, same style) that I'm not sure who I was looking at! Anyway, both played equally well. Danne as usual, nothing astounding but no mistakes. He had to shoot like 80% of the free-kicks or corner-kicks, which he did quite well. On the negative side: all players did at least one miss that could have cost us dearly. Except for the very begining and the very end, the whole game was on the left side, while Eken was all alone on his right side, with a defender he left in the dust (or in the mud today, considering the lousy weather we had) on repeated occasions. Olsson has no excuse for missing his one-on-one with the keeper in the 36th minute. Why on earth did Hiir-Sa and Sjöfors shoot or head into the keeper's hands, he barely had to move an inch left or right. He's against us, remember? Guoimar had a couple of very doubtful tackles, and he was probably close to a red when a almost got down the Bromma player who later scored. Johan Persson: he's like Hiir-Sa bis. The same agressivity, the same presence all around the plane, the whole game. He was elected man of the game for MAIF. Not that he did anything fantastic, he was just everywhere, supporting in offensive and defensive phases alike. That's a good thing, because if they are 2, we can see more of both in building phases and not only in the stopping phases. Johan Nilsson Guiomar: Good defender overall, but some unacceptable misses. Chritian Fegler: well it's hard to say, he has not had much to do. The rebound into the Bromma player's legs before the goal is just bad luck. the Bromma player who collided with his own keeper at the 90th should have been sent out way quicker, but I think the Bromma kids wanted to waste time, being quite happy with a draw at that point considering the way they had been dominated all along. Wille should have gone out earlier, he was clearly not at ease on the very slippery plane, and Sandström is clearly up to the task anyway. As to the Bromma kids, they should be thankful to have the goalkeeper that they have, he did some very good saves. He was elected man of the game for the kids. Well, we should rather say he was the man in game, the other 10 being merely figurants. Well now we're not last of the league anymore (and Qviding got a rouste in Jönköping, so their goal difference will keep them down for a while), and if this game is any indication, I don't see a reason why we should be fighting against relegation at the end of thIS season. Keep up boys, we want to see more of today's game. Just target your shoots elsewhere than on the keeper, and you will be scoring many goals. On a side note, Pavel (with family) showed up at the end of the game with Dusan (with family). I think SuperMink will put up a picture later.